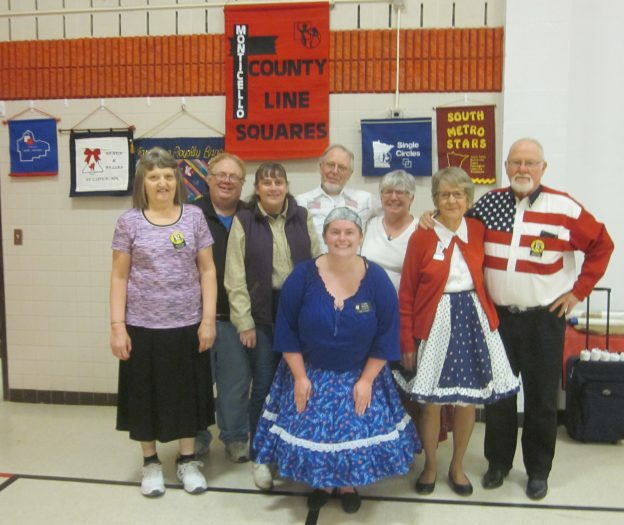 November 9, 2018 – County Line Squares “Red, White & Blue” Square Dance, Monticello, Caller Tom Allen, Cuer Sarah Klaphake. 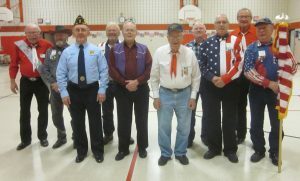 Dancers from Ar-Dale Dancers, Cambridge Corners, Hot Foot Stompers, Jolly Twirlers, Koronis Nite Owls, Spares & Pairs, and Westonka Whirlers joined County Line Squares at the dance. Also present were Cambridge Corners King Arnie, County Line Squares Queen Gael and King Doug, RoundUp Advertising Manager Connie Walker-Pearson, RoundUp Subscription Manager and Enhancin’ Dancin’ Editor Paul Pearson, SDM Treasurer Gael Zachman, and SDM Executive Director LeRoy Elfmann. Koronis Nite Owls claimed a County Line Squares banner (photo above also includes a Jolly Twirlers dancer). Veterans present at the dance.